Its fine foliage is much appreciated by certain fish which lay their eggs on it or, depending on the species, munch on it. These amphibian plants can live submerged, and when they reach the surface of water they spread out on top of it. At this point cuttings should be taken and transplanted. Good lighting is essential. A lack of iron causes their leaves to turn yellow. The aquatic ambulia grows well in soft or slightly hard and acid water, providing it has an adequate supply of mineral salts. Small shoots from its base are perfect for cuttings, although removing the top is equally effective. 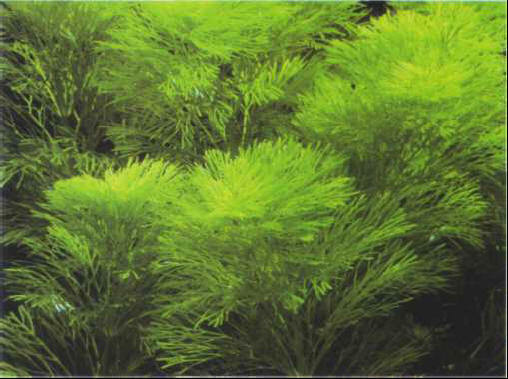 This ambulia must be planted in clumps, with the stems slightly separated to take advantage of the light. Size: 30 cm. The heterophyllous ambulia is less tufted than the above, but its tips must nevertheless be removed regularly. Size: 30 cm. КЛЕЧКОВСКИЙ Всеволод Маврикиевич (1900-74) , российский агрохимик, академик ВАСХНИЛ (1956). Одним из первых в стране использовал искусственные радиоактивные изотопы для изучения питания растений и эффективности применяемых удобрений. Исследовал поведение в почвах изотопов стронция, иттрия, циркония. Работы по теории периодической системы элементов. Государственная премия СССР (1952).